A unicuspid aortic valve (UAV) is very rare, with a reported occurrence rate of just 0.02% . However, it is also reported that in aortic valve replacement for aortic valve stenosis, a UAV is observed in about 5% of the cases , and it cannot be said to be a rare condition for cardiac surgeons. In addition, there are many cases diagnosed as a bicuspid aortic valve (BAV) not only on preoperative examination but also intraoperatively, and the actual frequency is thought to be higher than reported. Furthermore, the quadricuspid aortic valve (QAV) is an even rarer condition, the reported incidence by various researches is less than 0.01% . 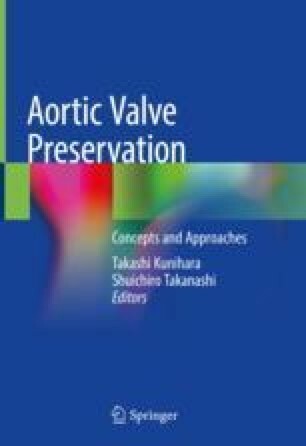 In this chapter, an understanding of the anatomical knowledge of UAVs and QAVs and valvuloplasty other than mainstream aortic valve replacement and autologous pulmonary valve transplantation by Ross surgery are highlighted with an introduction to past reports and experiences at the facilities where the author used to work in.